With the Internet various hobby communities have the potential to reach out globally beyond the United States. Sometimes however it hard to gauge just how much impact this has. Since the beginning of May, the Fantasy Hero kickstarter had plateaued roughly $2,000 short of it goal. It was slowly increasing but it was looking like it would not make it. Since the announcement of the kickstarter, international fans had been asking for an option to enable them to get into the kickstarter. Then a few days ago the Hero Games teams crunched the numbers and came up with an option. The result? The Kickstarter got funded a day after the announcement. You can see the effect in the daily data tab of Kick Traq. Thought this may be of interest to people involved in publishing or thinking of getting involved. First off we don't know enough of Wizard's marketing and distribution plans to do a critical review of what they are doing. Except that they should quit the dribbles, drabs, and teases of information and just tell us. I understand they need to get the distribution process going which means pre-orders and cover images on Amazon, game stores, etc. But only telling half of the story just means the peanut gallery is going to make up the other half. As to what I think about what has been announced? I am cautiously optimistic. I will get the books just I did with all other previous edition. I still feel that DnD Next will be a good second choice for the OSR. A game that we can play and enjoy at conventions and game stores but still continuing to use our favorite editions as our main system. I think that the signs are there that Wizards is going to distribute a set of character creation rules covering the basics. That it will probably look similar to the B/X style character creation rules both in content and brevity. Continuing the speculation, it will be a end run around Paizo if Wizards prints this as well as a freebie that anybody can pick up at their game store. Especially if they consider this primarily a marketing tool and use the marketing budget to fund it. Then turn around and use what they saved on the Starter Box budget to pack it additional content they otherwise could not include. I don't consider pre-gen characters bad as long as they are an addition to the regular character creation rules and not in liu of it. I am also open minded that they just may found a better way of distributing a RPG ruleset other than putting everything in a box or books. I will also point out that while the Pathfinder Beginners Box set is pretty good, it still a sealed game box. To somebody in the game store, they have to buy the box and open it before they can see what it truly is. If Wizards is smart and has a printed booklet sitting in the stores, this allows gamers to read something substantial before deciding whether the Starter Set is worth buying. But in the end until Wizards get their marketing communication straightened out we are all guessing. Fudge Playtest Report #4 (Magic) and the very alpha rules. Monday I ran another playtest of the roleplaying game I am working on that is based on Fudge and Fate. I talked about the adventure I ran. As well as some rules on the Characters. Today's post is on Magic. I am on the third version of the magic system. The first version was a spell slot system similar to DnD. The second... well it just didn't work. The third is a mana based system that works as follows. There are two classes of spells. Arcane and Divine. The spell lists derives directly from the d20SRD. I don't include all the d20 spells however. It basically the list from Swords and Wizardry with some additional spells that fits in with the flavor side of the system. Arcane caster start with a Mana Pool equal to their Fortitude + 4. Caster regain mana at 1 point per minute. Each spell has a mana cost associated with it. Arcane spells are caster with the Thamautology skill. The caster needs a 1 or better to cast the spell. The level of the spell subtracts from the roll making higher level spells more difficult to cast. The degree of success impacts the spell in various ways. Most importantly in making resisting certain spells more difficult. After Monday's playtest the degree of success will add to the damage of the spell. If the mage rolls a critical failure (natural -4) he rolls 4dF+ the mana cost and consults the Disastrous Magical Results table. If the mage has exhausted his mana pool, he can still cast a spells but immediately rolls 4dF + the mana deficit and consults the Disastrous Magic Results table. The spells that a individual mage can cast are the spells written in his spell book. However unlike D&D the caster doen't have to memorize the spell. The act of writing the spell into the spell book allows the mage to cast the spell. The mage can scribe spell of a level equal to or less than his Thamautology bonus. The spellbook also have to be available to the mage to use as part of the daily routines needed to cast arcane magic. The Divine caster starts with a Mana Tally, initially set to zero. The Divine caster can cast any spells equals too or is less than his Religious Ritual bonus. To cast a spell the divine caster has to get a 1 or better on a Religious Ritual Roll. The level of the spell subtracts from the roll. The mana cost is added to the religous caster's Mana Tally. If the Tally exceeds 20 then the caster has to immediately roll on the Violations of the Compact table. The gods of the default setting as largely agreed to operation on the basis of divine faith and excessive use of divine spells by a caster may result in the gods considering the spell a violation of the compact. Like arcane casters the degree of success effects the spell's effect particularly any required resistenance rolls. The Mana Tally is reduced by performing acts of piety. The most common of which is the daily prayer which subtracts 4 off of the tally. Both Arcane and Divine caster can cast their spells as rituals. Instead of gathering mans quickly and releasing it as a spell. A slow ritual gathers in the mana through the use of magical components. In general a ritual takes ten minutes and requires components equal to the spell level squared times 10 silver. Zero level spells cost 1 silver (or d) to cast. Included in the rules will be a magic item creation system. For example a scroll for one spell cost 100d per level to make and takes 1 day per 100d to write. A scroll can be made for any spell the caster knows, and doesn't require mana or adds to the tally. In Monday's playtest these was well received. The biggest issue is that I didn't add the degree of success to the damage caused by a magic missile. In the future this will be the case. What goint to make this work are the numbers. Having the right numbers to reflect a generic fantasy world that most gamers have experience with. +1 in Fudge is a significant bonus so it going to take some carefully planning to make it work. My goal is to create a system that is flexible but at the same time provides plenty of ready to run content. A system that make it easy through the use of aspects to implement specific setting details. A lot of been asking to look at the rules. I warn you, although nicely formatted, they are very rough and are only lightly edited at best. The major pieces that are missing are anytype of Monster list or NPC galley. 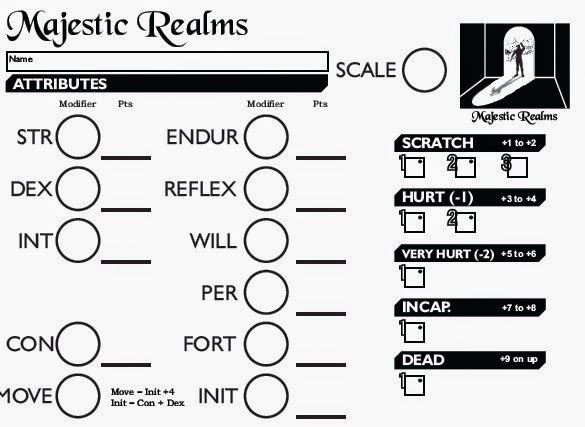 Aspects are vaguely define and I only provide concrete example for a generic Fighter, Burglar, Mage, and Priest. Only one example of a gift granted by an aspect, the ability of priests to turn undead. You can download the various PDFs from here. Today's post is on Combat. A combat round is six seconds with ten rounds in a minute. In general characters can perform two actions one of which can be an attack (melee, missile, spell, item). In general the idea is that you can perform a move and then attack. Quaff a potion and attack and so on. Character move in the order of their initiative roll. 4dF + Initiative. Or if you want they just move in the order of the their initiative score with dexterity breaking ties. I used the latter method for Monday's game. To attack with a melee or missile weapon is an opposed roll. For melee the defender has the options of blocking, parrying, or dodging. Dodging the defender roll 4dF+Dexterity+Acrobatics skill+Shield Bonus. You can parry once, block once, and have unlimited dodges. Except that every dodge after the first one is at -1 accumulative. (-1 for the 2nd dodge, -2 for the 3rd dodge, and so on). You can only block or dodge missile fire. If this sound familiar to GURPS it is. However what different compared to GURPS are maneuvers. In GURPS maneuvers are distinct actions to achieve a specific result. Maneuvers in the Majestic Realms RPG are lifted from Runequest II/Legends. In Runequest you compared the degree of success c if the attacker and the defender have the same level of success, then combat proceeds. However if there a different whoever have the better degree of success is able to perform one or more special maneuvers. (Disarm, bypass armor, trip, etc). I lifted this directly from Legend (Isn't the OGL great!) and applied this to game. I feel it really adds a lot to combat as the opposed rolls generate a richer set of results other than damage. What I am not sure of is how to generate the number of maneuvers. Either to use the same degree of success as Runequest. Defining critical results as either a natural +4 or -4 or a +5 or greater degree of success. Or just keep track of the relative degree of success from round to round allowing the person with a positive result to cash in for maneuvers. In previous playtest I allow players to hold their degree of success rather than just going for damage right away. It was felt that this represented gaining a positional advantage. The final damage roll represents exploiting the advent. The problem with this is what to do with the relative degree of success by the defender. The degree of success is applied to the damage roll. Attacker Damage = 4dF+Weapon Damage+Degree of Success+Strength+Scale. Defender Damage Threshold = 4DF+Fortitude+Armor+Scale. If the attacker wins then injury results. 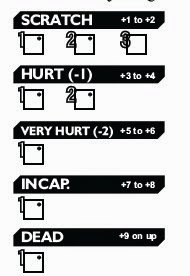 A character can take 3 scratches, 2 hurts, 1 very hurt, 1 incapacitated and of course 1 death. If you are hurt, you are a -1 to all rolls. Very hurt you are at -2 to all rolls. If they are out of any level the damage is applied to the next worse level. So if you are out of hurts and you take another hurt it is applied as a very hurt wound. So far the system feels fairly deadly. Finally I added a combat section to the characters that has everything pre-calculated. Hopefully this is to speed up play over the long term. The total modifier for the Attacker is the Offensive Combat Value or OCV. For the Defender it is a the Defensive Combat Value or DCV. Yeah a little Hero System in those terms. Next time the magic system. Fantasy Grounds is now available on Steam. You may want to check out the comments in the Steam discussion. Ignoring the troll posts it is interesting to see the question and comment made by a group of gamers who are mostly outside of the hobby of tabletop RPGs. Also there is more than a few "How do I get started with Pen & Paper" questions. It would be nice those veteran tabletop gamers with Steam Accounts took the time to answer. New blood always helps the cause. I blog around Fantasy Grounds here. I compared Roll 20 and Fantasy Grounds here. The only thing I will add that last Monday I experienced my first downtime with Roll20 (lasted for a half-hour). Right now I consider Fantasy Grounds and Roll20 the two choices. Likely this remain so in the near future, mainly because they have two fundementally different approaches for presenting a tabletop. One is standalone software that each member of the group have to own. The other is a web based app that has a subscription fee of up to $120 a years to get all the bells and whistles. Which one works bests depends on the individual. In terms of overall quality they are equally good. I talked about the adventure I ran in yesterday's post. First off I do not use the adjectives of either Fudge or the Fate Ladder. I will provide a chart at the beginning of the rule but everything is expressed in numbers. In general if you roll a +1 or better you succeed at whatever you are doing. The primary Attributes are Strength, Dexterity, Intelligence, and Constitution. The secondary attributes are Endurance, Reflex, Will, Perception, Fortitude, Move, and Initiative. Endurance is based off of strength. Reflex off of dexterity. Will and Perception off of Intelligence. Fortitude is based off of Constitution. Initiative is equal to Constitution + Dexterity. And Move is your Initiative +4 and is the number of yards per action you can move. Scale represents the size and mass of the person/creature. Each point of scale is 1.5 greater size and/or mass. If a normal human averages 6 feet and is at Scale +0. A +1 Scale creature is around 9 1/2 feet tall. A -1 scale creatures is around 4 feet tall. Note that Halflings are at scale -1 while Dwarfs are at Scale +0. The dwarves are short than human but have a similar mass. Scales factor into strength, and damage rolls. As well as damage resistance. It is a simple but elegant method that Fudges uses to handle character of radically different sizes. You buy your Attributes in accordance to this chart. I have about 63 skills defined. Divided into Adventuring (Climbing, Stealth, etc), Arcane (Thaumatology, Alchemy, etc), Melee (Sword 1H, etc), Missile (Bow, etc), and Professional (Animal Handling, Mining, etc). Each skill defaults to +0 (Brawling), -1 (Sword 1 handed), or -2 (Thaumatology). You buy skills in accordance to the following chart. For a campaign, I recommend picking five aspects. A high concept, a trouble/complication, and three background aspects. My take on aspects probably will be the most controversial thing about this game. In a nutshell they replace what GURPS and Hero System uses for Advantages and Disadvantages. They can be purely roleplaying or they include additional powers and mechanics for the character. For example taking the High Concept of "A priest of Delaquain, goddess of justice." Will confer the ability of turning undead on the character. Taking one of the mage high concepts will allow the character to use Thamautology to cast spells. YOU DON"T PAY CHARACTER POINTS. Nada, zip, zilch. You just right it down on your character sheet. So what the catch? The catch is that your referee will define the available aspects for his setting. In addition these aspects will come with consequences as defined by the referee. For example a Paladin of Delaquain will have superior abilities over that of an ordinary fighter. But a consequence is a requirement to follow the Five Fold path. And a big consequence is the undivided attention of the goddess Delaquain as you are now one of her champions in the mortal world. So what to stop a group from having aspect like God of Thunder on their sheets. Nothing, if that how you want to play your campaign go for it. I know for me having uber power quickly becomes boring and soon I am seeking other challenges. I suspect most of you are like that as well. You see GURPS, Hero System, Fudge and all the other point buy systems with their advantages, disadvantages, gifts, faults, talents, etc, etc are a rat race in my opinion. What does a point mean, how much work is enough to balance everything out according to cost? I been playing some of these systems so long that some are on their third or fourth cycle of rethinking costs. What works consistently is making the mechanics reflect your setting. If a character is required to do X, Y, and Z to achieve the maximums fitness package, then that what the character needs to do during the campaign. Not trying to scrimp together X points to buy it. To fair what GURPS and other games do is recommend both. You have to do the roleplaying in-game AND have the point on hand to get whatever. However my group (+Tim Shorts +Dwayne Gillingham) we wind up ignore the points stuff after the campaign starts. Dwayne as William Enderil becomes the wealthiest man in the City-State. Does he have to buy Very Wealthy, nope it just the consquence of how the campaign played out. His points went into improving things like accounting, and his weapons skills. Maybe buying the Fit Advantage. The same for Tim's character Dracolindus who manages to become a Duke. Does he need to buy social status, nope. This will codify what I been doing across multiple systems for the last 15 years. That many issues with mechanics cease being important if the focus on making the mechanics reflect the reality of the chosen setting. Now right now in this playtest I don't have a lot of these aspects defined. I plan to draft a "ready to run" set of aspect to allow a bog standard fantasy campaign to be run. For those of you who have my Majestic Wilderlands Supplement can see some of these ideas in a more polished form. Particularly in my comments about how the classes and races are not "balanced" but rather reflect how the Majestic Wilderlands works. Tomorrow we will look at combat and then in the concluding post the magic system. After reading some sales data provided by OneBookshelf (RPGNow, DrivethruRPG) I have decided to permanently drop the price on the print copy of Blackmarsh to $4.99. You can read the blog post about pricing here. The setting was the City of Tashal from Harn. I used Harn instead of City-State because in a unrelated project I am working on a urban adventure and didn't have time to do the detailed maps I wanted. Luckily over on Lythia.com, a dedicated Harn fan mapped out an entire city block of Tashal that had all the elements I had planned for the adventure. A few modifications, some uploading of files to Roll20 and I was done on the prep. A traditional skill list expanded from my MW Supplement ability list. Fudge style combat where your to hit is an opposed roll. If you win the degree of success is applied to your damage. I added combat maneuvers modified from Runequest II/Legends. The spell system has been revised a third time. This time everything is based off either a Religious Ritual roll for Divine spells, or a Thaumautology Roll for Arcane spell. The spell level subtracts from the roll making higher level spells more difficult to cast. Arcane spells take mana to cast which based off the character's constitution. The mana for Divine spells are kept track in a mana tally. If you exceed a threshold you are deemed in violation of the divine compact and various "bad" things can result for the caster. The scenario I felt went well. For this adventure I embraced the traditional "meeting at a tavern" trope with a vengeance. The characters for the most part either worked at the tavern or had a relationship with the tavernkeeper. A new mechanic I was trying out was a way to simulate the ebb and flow of tavern life. I noticed that the Harn Urban Encounter rules had some interesting features. The Harn book tells you to roll every minute. That if you roll a 16 or higher you generate an encounter. When I plugged this into Inspiration Pad Pro and generated 240 encounters (two hours) the result felt like what would be happening if you were just standing there in the tavern. On average 10 to 15 minutes would go by before an encounter happened and there were the occasional burst were three or four encounters would happen in successive minutes. I attempted to run the playtest last Monday but only Chris was able to play. So I ran a short session with him acting as a bouncer. I used the above encounter method and got good results. Like with all random encounter tables, I had to apply a little creative interpretation of the results. Afterward, Chris remarked that it felt natural and was fun to deal with. Now back to last Monday, I tried it out on the whole group, and the results were about the same. The main difference I focused on each player in turn. Every fourth encounter focused on a particular character. But for most encounter that didn't stop the others from jumping in. I think I need to come up with a better table geared towards tavern life but the basic idea is very workable. After about a hour or so of dealing with the tavern, the rest of the adventure unfolded. This led to the group being hired to look for a wayward young noble lord who happened to be the grandson of the King. The party combed the back alleyways of Tashal, gambling dens, and finally confronted a vampire in a crumbling tenement. They didn't destroy the vampire but managed to rescue the young noble. And that where the session ended. Everybody did a great job roleplaying. Tommorrow I will dig into the system. By 1985 I was looking for alternatives to ADnD 1st edition. The game that inspired me to make the break was Fantasy Hero. Like most of the hero system games, it was a complete standalone RPG. By the late 80s the Hero System adopted the same format as GURPs and other generic system by having a central core book and then follow on sourcebook detailing a genre or setting. At first a fan of this (for both GURPS and Hero System), around 2000 I felt it to be a huge detriment. The core + supplement was very convenient to use as a reference, but failed miserably in helping my friend learn or to adopt the game. The buy-in was too great. This is in contrast to Chaosium and Basic Roleplaying which maintained a series of standalone RPGs while still putting out the occasional supplement that supported the entire line. GURPS still has this issue but Hero Games has decided to return to the older format. At first with Champions Complete, and now with Fantasy Hero Complete. They have launched a kickstarter to get the book published. Fantasy Hero has the typical mechanics that most skill based systems have. Skills, Characteristics, Talents, Disadvantages, etc. Like GURPS they are setup through the points you get at character creations. What makes Fantasy Hero shine is the use of the Champions power system for spells and magic items. The amazing flexibility of this allows referees to define campaigns with radically different magic systems. If you are crazy enough you can even have a campaign with multiple magic systems. Thanks to the powers framework you can see how they relate to each other. Here is a link to a review of First Edition Fantasy Hero. Joining the Wilderlands of High Fantasy Map together. With the successful conclusion of the Judges Guild kickstarter it would be good to explain how to join the maps together. Those of you with maps from the Necromancer boxed set or the original maps can immediately try this for yourself. Each Hex maps had 52 columns, and 34 rows on the odd columns (1,3,5, etc) and 33 rows on the even columns. The resulting hex grid had uneven ends on the left and right edges. You can see it for yourself in this PDF of a blank campaign map. 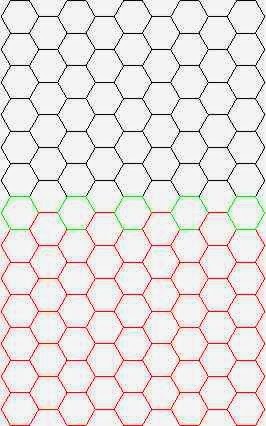 As I explained in this blog post, there are number of methods one could use to join two hex maps with uneven edges. The one that Judges Guild ultimately choose was unusual. But then again they were the very first to deal with this. First off there two type of joins you need to look at with the Wilderlands maps. The first is on the east and west edges, the short side of the map. The second is on the north and south side of the map, the long side. The rule for joining the maps on the long side is easy. They overlap on the bottom hex of the odd numbered hex COLUMNS. Hex 0134 of the northern map overlaps hex 0101 of the southern map. The following graphic shows this. 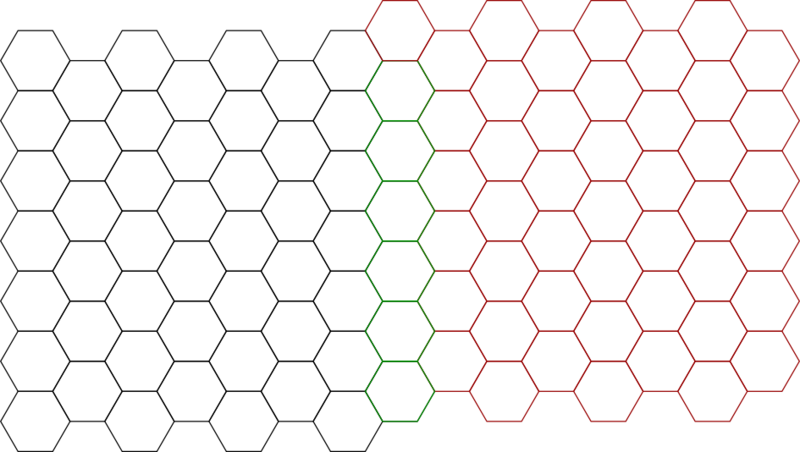 The green hex shows where the two overlap. The rule for joining the maps on the short side is not so obvious. 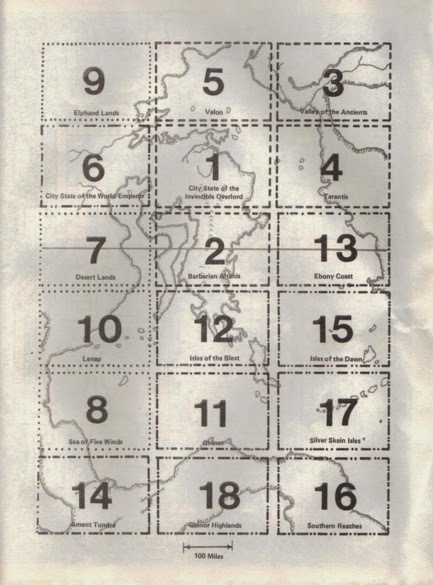 The western map's 52xx column overlaps the eastern map's 01xx column however you shift the western map down one hex. So that western hex 5201 is the same as eastern 0102. The following graphics illustrates this. Finally the original maps have mistakes. For example the toe of the Isle of the Blest on Map 17 needs to shifted up a hex to align properly with the rest of the island on Map 11 and Map 12. Some maps have two different villages for the same hex. Where Map 6 Viridstan joins with Map 1 City-State the settlements are shifted down a hex on Map 6 compared to their Map 1 counterpart. For now I will say that these issues are being resolved as Judges Guild Team go through the process of drawing the new versions. Fortunately none of the known problem will force a substantial change. One thing that I always had a difficult time creatively is with Faeries. It is easy to treat them as magical cultural forming races with a few monstrous types. But in my mind they are something more than just another race variant. In our history faeries have their origin in folklore. What they are depends on the culture, time and place. Some of DnD"s conception of faeries is from the Victorian age cute little winged folks with a dose of "going back to the original" spirit of Tolkien and other fantasy authors. As a consequence there is no defining explanation of faeries. Since my first campaign this has caused a disconnect creatively for me when it comes to using Faeries in my game. I do use them but in specific and narrow ways. This is contrast to politics and religions where I can think of a dozens of interesting situations and details with a few moments of daydreaming. Some authors have the knack of what I consider the spirit of faeries. Beings that are dangerous, beautiful, and magical. Raymond Feist's Faerie Tale, and Jim Butcher's use of faeries in the Dresden Files I consider to be excellent examples. They help as idea generators but still don't help be "get" faeries for my own use. I also collected several RPG Books on Faeries particularly GURPS Faerie and Ars Magica various Faerie books. But it never really clicked for me until I read the newest Realm of Power: Faeries for Ars Magica. Because it offered an overarching explanation. Faeries are what they are because they are magical beings that feed on human imagination and vitality. And they feed by using their abilities to cause people to participate in stories. In short they can generate what they need by directing the fantasy equivalent of a LARP event with the local human as participants. The problem being that many "events" they stage are dangerous. Like all Ars Magica books Realms of Powers: Faeries has a very exhaustive and detailed writeup of faeries. Plus it is tailored to the Mythic Europe setting of the series. After thinking about it for a while here a generalization I came up with to help in the future to run campaigns with faeries. Like my other advice, I present it as one possible technique among of host others. In a fantasy setting, magic manifests itself in many way. One could learn spells as a skills and cast them by drawing on the ambient mana. One could use a elaborately written codex to memorize a spell in such a way that it captures magical energy that later can be released as a spell. Magic can be captured in place into the object. Some creature can channel and/store magic and use it to power a variety of abilities. Faeries arise from the interaction of magic with human sentience. Life experiences left an imprint on the surrounding magic of an area. In most cases this is fleeting, but if the experience is particularly intense or many people were involved the effects can be far more lasting. Lasting enough to allow creatures to make it the basis of their existence. Those creatures are the faeries. And like their mundane counterparts these creatures began to act proactively. Not just in finding out places and people who have intense experiences but recreate the circumstances of those experiences in order to continue feeding. In the fullness of time the faeries began to develop distinct techniques. They also began to specialize in specific type of experiences. Producing a bewildering array of different types of faeries. Since human life experiences are subjective and largely based on the specific circumstances of family, cultures, and geography there is little consistency in the abilities and actions of faeries. However faeries are not the only force in the setting; other types of magical creatures, magic users, and above all religions. Faeries are in essence scavengers and often have to retreat when confronted by other supernatural forces. This results in what is the most consistent aspect of faeries; that they exist on the margins of civilizations and as folklore. This works for me as a general explanation of faeries that I can apply to a variety of setting other than the Mythic Europe of Ars Magica. From this I thought of a more specific set of guidelines. Many faerie powers are illusions. Things created by faeries seems real until the experience ends or the person leaves the immediate vicinity of the faerie. Then they revert to their true nature or outright disappear. Faeries vary in their abilities to recreate experiences. The average faerie is not very good at doing this. Allowing an observant person to spot that something is off and figure out that they are in the midst of faeries. The ones that are good are very good and even the wisest have trouble getting out of their traps. The ones that are good have gotten that way because with luck and times they succeeded in collecting many experiences. Because of this they have a lot to draw on when trying to get people to live out stories. However like their less skill brethren, they lack true creativity so cannot fully account for everything a specific individual will do. Faeries are known to work together in order to recreate a bigger experience then they could do alone. For example a three faeries could work together as a team to recreate a dragon slaying adventure. One faerie manifests as a wise old man seeking a hero, the second as a dragon slaying sword, and the third as the dragon itself. Together they try to get some unsuspecting person to recreate the quest to kill the dragon. Faeries have found that there different flavor of experiences with different trade offs. For example a monstrous faerie can have a big feeding by terrorizing a village but it is fleeting and runs the risk of somebody trying to destroy the faerie creature. A house fairy may only feed a little each day by repairing small items but the gratitude of the owners is long lasting. The existence of the Seelie and Unseelie court is largely based on what type of experiences of their respective members specializes in. Faeries can be sentient, animal, and non-sentient. Non sentient faeries can manifest as a place or environment that causes an intense experience. 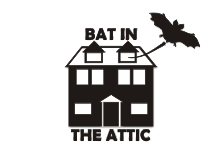 Think of haunted house that really creeps you out. In a fantasy setting, this could be the work of a non-sentient faerie. Non sentient faeries can manifest as an object that causes an intense experience. For example the dragon slaying sword mentioned above. Of course if unfortunate individual happen to encounter a real dragon then there will a problem as it not a real dragon slaying sword. Or it might not as the faerie manifesting as a sword happen to be powerful enough to take on a dragon. This inconsistency is why dealing with faeries is so maddeningly difficult. Animal level faeries generally are older types of faeries trying to recreate simple type of experiences. For example a wolf terrorizing a village, or a horse that helps a village plows its fields in a day. Sentient faeries are the most dangerous as they are capable of recreating sophisticated and complex experiences. They are also capable of learning by collecting new experiences to add their palette. The purpose of this exercise is for me to generate interesting situations involving faeries. By having an underlying "reason" I can use it as a template to develop what the players will deal with. It also also for the players to master faeries by making what they are discover-able. Although in this particular case it doesn't make it much easier because you still have to figure out what a faerie is actually trying to recreate before you can truly defeat it. Hope you find this useful for your own campaigns.